1962 was a historic year for the Catholic Church, as the Second Vatican Council, which would bring so many momentous changes, began in Rome in October of 1962. Several Columbans would attend some of the Council in Rome. But another momentous event also occurred in 1962 which had particular relevance for the Columbans: acclaimed Irish author Francis MacManus published a book on the life and history of Saint Columban, for whom the Society had been named. This was not the first profile of Saint Columban. A number of religious and secular scholars had written books and articles on him. 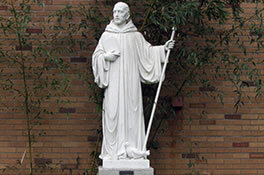 In fact, in 1927, Columban Father Edward J. McCarthy had written a booklet which provided a historical sketch of the saint, Columban Father James Wilson wrote a biography of Saint Columban in 1954, and a lay author wrote a biography of him in 1915. But MacManus’ book, Saint Columban, was a full-length book, which built upon the research that the other scholars had accomplished. In fact, MacManus thanks the Columbans Fathers prominently in the Acknowledgments section of Saint Columban. The MacManus book set the stage for a great deal of further scholarship on Saint Columban, particularly by Columban Father Neil Collins. In 2012, a non-Columban priest, Father Aidan J. Larkin published Saint Columbanus, Pilgrim for Christ, which incorporates much of the latest research on Saint Columban. The year 2015 marked the 1,400th anniversary of the death of Saint Columban, and many commemorative articles on Saint Columban appeared in the 2015 issues of Columban Mission magazine. A great deal of these drew upon the research work in Francis MacManus’ Saint Columban.